Well so far it seems this will be a low drop rate from dig sites as most of the others have been. I received 3 from my first dig and none since. This is my 4th dig site. Edit: Just received 4 more from an angry spirit. Edit: It looks like Angry Highborne Spirit have a 100% drop rate. Three popped up and I received a min of 2 and a max of 4 from them. For the quest you must obtain 15 Azsunian Key Mold Pieces. The drop rate on these is very low, however, the angry spirits have a significantly higher drop rate. On average I'm currently getting less than one per dig site. Happy grinding! Working on the quest tonight, for the most part the dig sites are where there are mobs so you spend more time attacking then digging, and had to give up on them with my holy priest. One of the dig sites is where the Elite ghosts and mobs are, up above where The Eternal Mages world quest is (around 56.71), one of my dig sites is way off to the west that when i mouse over it, it says Nor'Danil Wellspring. Since there is a location with that name that has ghost ladies, I went to it (around 36.30), NO dig site found. So it leaves me chasing one dig site around the zone. Four sites cleared and I am currently at 10/15 Azsunian Key Mold Pieces. Will update later when quest is complete. Dig at any of the archaeology sites in Azsuna to receive these. I got my first 7 pieces directly from digs. Then one of the angry spirits popped up and I looted 4 off of him. Thought it was worth mentioning that you can not loot off someone elses angry spirit even if you tag it. I had another player keep damaging my spirits but he couldn't loot them. Side note: The Tidal Marsh dig site is up between Azsuna and Val'Sharah but it doesn't show up on the map. It is right above the Chilliane's Terrace flight path near the daily falcosaur quest. Follow up quest is to go to Dalaran and visit the blacksmith and you have to play a little minigame of click the action bar while standing in the right spot. Then when you go back to Azsuna to the quest NPC he gives you Chave da Academia de Nar'thalas/key-to-narthalas-academy as a reward which leads to the title Headmistress <YourNameHere>. Just go to the academy, go to the room with the dailies (runes/books/etc). Use the item and talk to the Headmistress to duel her. She takes a while to kill but has 3 avoidable attacks and as long as you can heal yourself you should be able to solo it. After defeating her, you are granted the reward Headmistress. This is not an account wide title it is only available for the character you did it on. This was one of the quickest archeology quests that I have done, It only took me 20 minutes to get all 15. Angry Highborne Spirit will occasionally spawn while your gathering an archeological fragment. Kill it for the Azunian Keymold Piece x 5-8. Again with a digsite that is not possible for all classes unless you are well geared and a great player. Temple of a thousand lights (Azsuna) is very unfriendly. Elites that you can't get one of at a time. Don't waste your time here. As if Archeology wasn't boing enough..... This was a slog with a low drop rate. Just a comment regarding the digsite of the Temple of a Thousand Lights. I was confused at first too, you need to go all the way up to the top of it, thru the bottom bit with all the banshees. Don't go in the temple on the lower half even tho the telescope will let you use it there and it appears to be pointing in that direction. If you aren't in the bit with the elites, you are in the wrong section. Can anyone confirm these actually are available in surumar? "I'll just take a small detour between these World Quests and finish up this archaeology quest" ... yeah, right! Buckle your seatbelt, Dorothy! Drop rate didn't seem too bad. Got this done today (1/24/17) in four digsites. Only dig in Azsuna. Got 3, 5, 0, then 7. The majority of them came from Angry Highborne Spirits (I think I had 3 spirits that each gave 2 or 3) that would random spawn after digging sometimes (like most gathering profs). Regular digging would occasionally grant a quest item as well. Drop rate in Azsuna has become really frustrating. Got several in first few digs (incl. angry spirit or two) and was encouraged. But since then has tapered off to nearly nothing. Half a dozen digsites now without a single piece (or spirit). Glad the RNG is treating some of you better, but honestly wish they respected the time of the rest of us a bit more. So, you have to collect fiftheen Pedaço de Molde da Chave Azsuniana, find any dig site in Azsuna, travel to there and start digging. You may dig out pieces with terrible chance or loot 2-5 from Espírito Altaneiro Furioso, that may be spawned as you digg out a find. Chance isn't high too. This quest is depending of your luck. 4 sites-3 pieces-0 spirits;one of the moments i feel rather stupid playing the game....Elites are a simple annoyance at temple for a reasonably geared paladin tank,but I can see why many classes should simply skip that site(and the priceless feeling of getting 0 pieces after completion). Either I have suffered EPIC negative RNG or Blizzard needs to tune this quest. I have completed 10 sites so far with only a single Key Mold. I have not spawned any Angry spirits, but i have spawned several of the friendly types that drop an extra artifact fragment. I am taking a break from doing this quest to grind out WQ's for the day before returning to see how long it takes to wrap this one up. I tried this quest and every day i went digging for about 2 hours didnt have much luck found only 3/15. The last day of the quest as you can complete it i found 12 within 30 minutes. Maybe its a theorie don't know if it actually works but maybe the droprate increases the last day? Ps: It is a horrible quest. I am seeing sites with what look like overlapping areas, and the area in the overlap gives me "You can't use that here" when I try to survey. Yet another archaeology quest in a long list of them where I think to my self "why oh why am I doing this to myself?". I had to rely on the rare spawning of angry highborne spirits for my key mold pieces, each of which yielded between 2-4. Only got 2 pieces out of the 15 needed through regular digging. I completed 11 artifacts while doing this quest if that tells you anything, but lost track of how many dig sites I completed. Avoid the Llothien (north of Narthala's Academy) dig site, it's bugged. In fact quite a few places where you're supposed to be able to dig up something appear to be bugged in Aszuna. 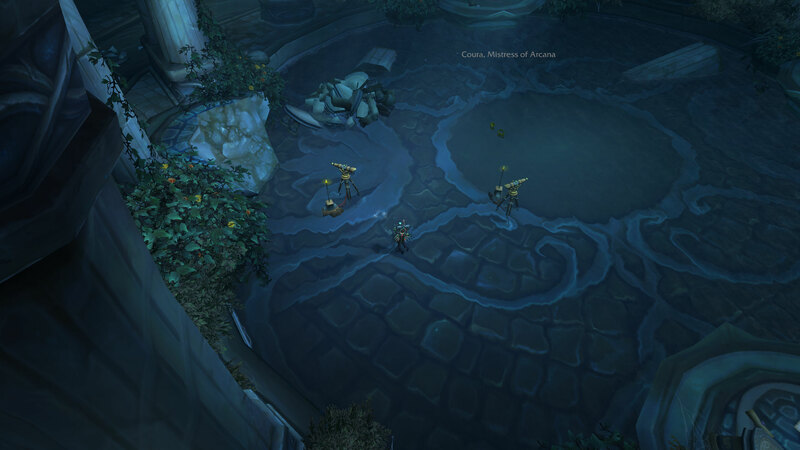 Once you finally get the mold pieces you get the distinct pleasure of going back to Dalaran where you think you're turning in the quest and finally done, only to do a series of menial tasks, before the quest asks you to fly BACK to Aszuna, for the final turn in. Truly an awful quest. Mine is bugged. I can complete most of the digsite, but I get the 'shiny spade' overhead, it says "You can't use that here" I am in the digsite (red on my minimap). So now 2 of the 3 digsites do this and I can't complete it. Tried relogging with no avail. Terrible drop rate on this quest. I have done 5+ dig sites (kinda lost track already) and have 2 out of 15 Key Mold Pieces. It may be worth mentioning that my Archaeology skill is only 775. I also haven't seen 1 angry spirit yet. Furthermore the dig site filled with elites did not drop any Key Mold Pieces, I was hoping it would have a higher drop rate. I did this today. Most of mine came from looting mass graves which spawned angry spirits. I think they might have buffed the drop rate. I have gotten all 15 quest items within 2 dig sites. I'm not here to brag, I could also have been extremely lucky. Can you guys confirm the drop rate has been upped since 7.3.5? If you're in a raid, you won't get any of these while killing an angry spirit. Drop raid, rejoin. Stupid stupid stupid drop rate. I'm at around 18 dig sites (lost count exactly) and am at 9/15. I know the total is 16, just wanted to include the total amount being dropped by the Spirit. Took me about 40 minutes or so. Encontre os 15 Pedaços de Molde da Chave Azsuniana restantes e fale novamente com Tae'thelan. Eu percebi pela experiência que os métodos antigos são geralmente os melhores por bons motivos. Cansei de experimentar métodos alternativos de escavação e quero focar no jeito certo de fazer as coisas. Tendo dito isto, eu acredito que encontrei um novo artefato poderoso e vou fazer o que for preciso para tê-lo. Descobri um fragmento que parece ser o molde de uma chave. Agora só preciso dos outros pedaços. Conseguiu encontrar algum dos outros pedaços? Sim, acredito que isso é tudo. Agora só precisamos forjar um novo conjunto de chaves.